One of the biggest NYC events in November is happening this Sunday, and it involves more sweat and costumes than you probably experienced during Halloween. 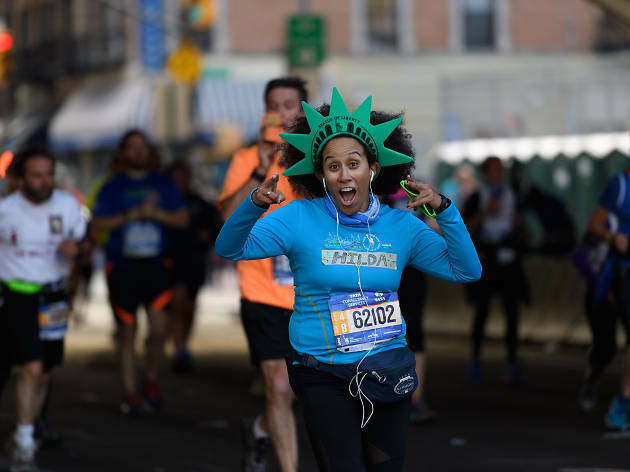 That’s right, we’re talking about the TCS New York City Marathon 2018, which will span all five boroughs this weekend. Dedicated athletes hit the pavement at the start line on Staten Island before running through Brooklyn and Queens. Then, these Olympian-like humans travel to the Bronx before reaching the finish line at Central Park in Manhattan. Even if you’re not participating in the race, you can still be involved. These runners need your support and clever signage to keep them going. So read on for everything you need to know about the New York City Marathon, including where to watch, important road closures, the route map and more. When is the NYC Marathon 2018? The NYC Marathon is on Sunday, November 4, 2018. It starts in four waves at 8:30am. Read the full start timeline here. Where is the NYC Marathon 2018? The 26.2 mile course travels through all five boroughs. 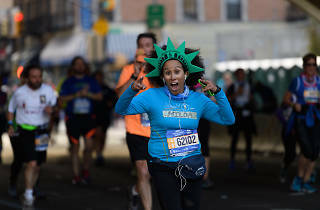 The starting line is on Staten Island at the Western end of Verrazano-Narrows Bridge and participants run through Brooklyn, Queens, Manhattan and the Bronx before crossing the finish line in Central Park, just outside of Tavern on the Green. Take a look at the map with all the info on subway closures for the day here. Where does the NYC Marathon route start? The starting line for the race begins at the Western end of Verrazano-Narrows Bridge on Staten Island. Where does the NYC Marathon route end? The finish line for the TCS NYC Marathon is at 67th Street on West Drive. To see the final yards of the race, you must purchase Grandstand Seating tickets here. The Family Reunion area in Central Park is open from noon to 5:30pm. There is also a standing spectator area located inside Central Park from Columbus Circle to the south end of the grandstands, about 500 feet before the finish line. Study the finish area map here. Where can I watch the NYC Marathon 2018? What are the road closures for the NYC Marathon 2018? Good luck to all of this year's participants! And make sure to treat yourselves to some carbs beforehand!